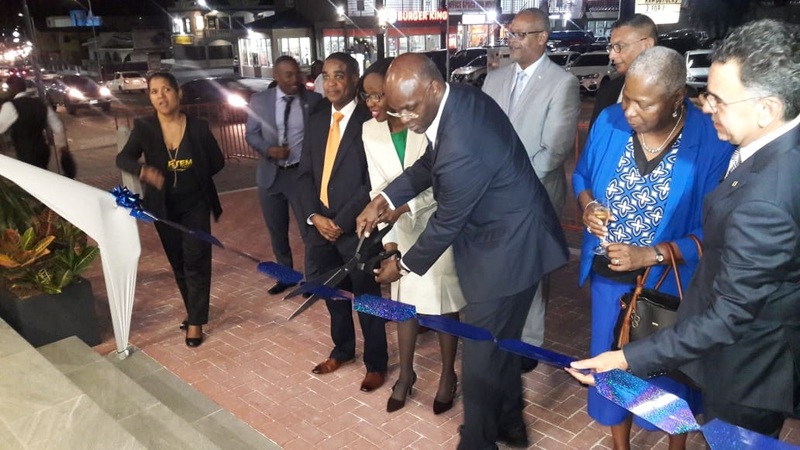 PHILIPSBURG — “There is an urgent need to invest in the national infrastructure and the economy,” said Governor Eugene Holiday during the opening ceremonies of the Windward Islands Bank Bush Road Branch. He stated that the significance of the event is more than the official opening of a new bank branch. 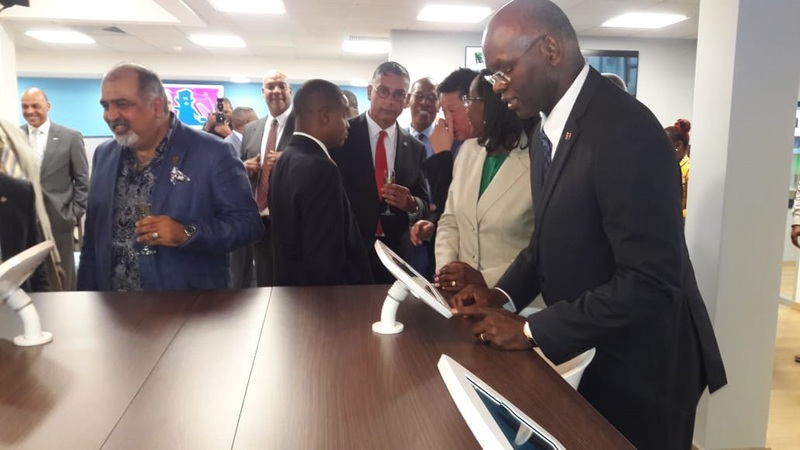 The governor pointed out that the opening demonstrates the continued confidence of the economy as well as a vital role of in advancing St, Maarten digital infrastructure for social economic growth. He reminisced on what Bush Road looked like when he grew up in the area as a boy. He remembers what is was when there were just a few families who invested their hard earned cash to create opportunities for their families, communities and their country. He described the way the people kept their monies in their shoes, mattresses or in a safe as “self-service” banking and noted the change as these practices have changed dramatically over the years. He mentioned that these changes teaches us that our economy has evolved and new realities of the digital age where technology play a central role in our daily lives. “It is a reality where everyone and everything is connected on line. It is imperative to us as a country to invest in the upgrading of our national digital infrastructure,” said Holiday. It was stated that the banking sector plays a critical role as a user and a financier of the physical infrastructure. He lauded the efforts of the banking sector as a vital one for the effective and efficient functioning of our economy and indicated that it is important as the life blood of economic activity is indisputable. 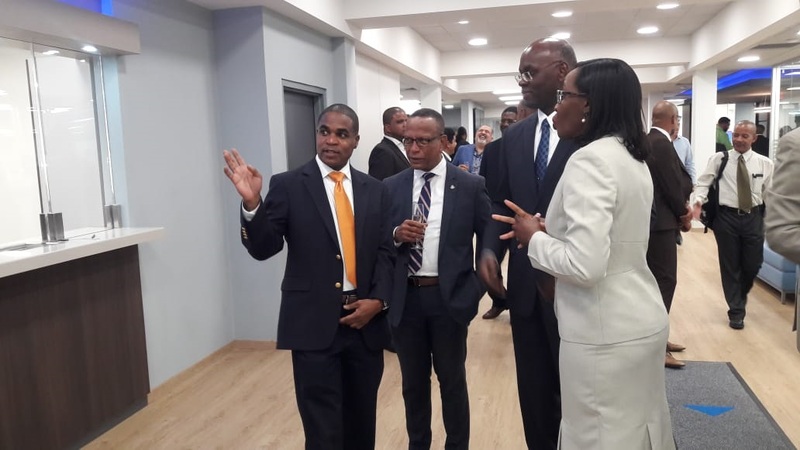 “Windward Islands Bank which was established as the first commercial bank in 1960 on the island and as a result the opening of the bank on Bush Road is seen as a welcome step in the partnership because it furthers the advancement of St. Maarten national digital infrastructure. General Managing Director Derek Downes said that the opening of the new branch represents a symbol of our resilience and faith as a people to overcome severe challenges as the island rebuilds after the devastation of the island by the hurricanes of 2017. “We understand and appreciate the importance of a vibrant financial sector for fostering economic growth and development of St. Maarten,” said Downes. He pointed out that the Windward Islands Bank will continue to be a valid partner in the effort. He mentioned that the new branch is a testament of the commitment in keeping with the forefront of banking by offering products and services that leverage the advances in technology. He noted that the Bush Road branch offers the latest advances in digital banking and assures the general public that more innovative solutions will be coming in the very near future.